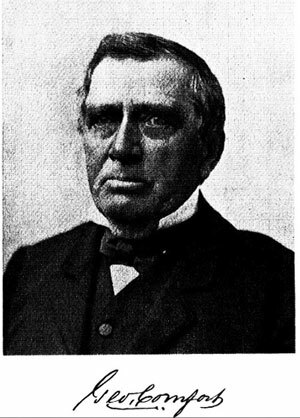 Samuel Comfort Jr., son of George and Susan (nee Lower) Comfort, grandson of Samuel and Rebecca (Moon) Comfort, great-grandson of John and Mary (Woolman) Comfort, was born at the Comfort homestead near Morrisville, Bucks county, Pennsylvania, on 5 May, 1837. The Comfort and Lower families were both prominent members of the religious movement Society of Friends (Quakers). George Comfort (1808-1887) was born at the family homestead in Bucks county, and spent some time working as a teacher in Philadelphia, but around 1830 returned to Bucks county and took possession and management of his family homestead. He was one of the directors of the Fallsington Library, and for 35 years was school director of Falls township. George Comfort married Susan Lower (1812-1888), a daughter of Abraham Lower (1776-1841) and Susanna Stackhouse (1779-1856) of Philadelphia, and they were the parents of 7 children: Annie (b. 1831), Caroline (1833-1834), Rebecca (b. 1835), Samuel (1837-1923), Susan Elizabeth (1843-1866), Georgianna (1853-1916) and William G. (1854-1857). Samuel Comfort was educated under private instructors and at the nearby Trenton Academy. At an early age he developed special talents in mathematics, sciences and mechanics. In 1850s the young Samuel devised numerous agricultural improvements in mowing and reaping machines, sewing machines, etc., for which he received numerous patents (by age 24 Comfort held over 12 patents in the USA, and Great Britain for agricultural machines). Despite his Quaker upbringing, in 1861-1865 Samuel Comfort took active part in the Civil War and present numerous battles or skirmishes of more or less importance. On 8 October 1861 he joined the Union Army as part of the "Anderson Troop," the bodyguard of General Buell, in Kentucky, Tennessee, Mississippi, and Northern Alabama. In September 1862 he was honorably discharged form the service on account of physical disability (typhoid fever) contracted in the service. 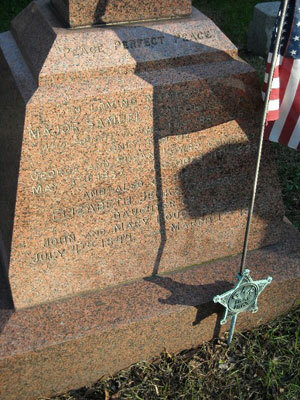 In June, 1863, he recruited at his own expense an independent company of cavalry in Bucks and Montgomery counties and the city of Philadelphia which was mustered into the service for a term of six months under the name of "Captain Samuel Comfort, Jr.'s Independent Company of Cavalry, the Bucks County Troop." Captain Comfort was wounded in the right arm while in Command of the skirmish line in the battle of New Market, in the Shenandoah valley, in 1864, and was promoted to be major of the Twentieth regiment Pennsylvania Volunteer Cavalry in March 1865. He was mustered out and honorably discharged from the service as major of the first Provisional Pennsylvania Cavalry, July 25, 1865. After the war, Comfort first established himself as a manufacturer of agricultural machinery in Newtown, founding the firm of Cornell & Comfort (in 1866 he patented a counting-machine). In 1871, he joined the petroleum refinery of his brothers-in-law Pickering, Chambers & Co., located in Titusville, Pa, which later became part of Standard Oil Trust. From 1879 to 1898 Comfort represented Standard Oil both domestically and internationally, including six years managing the business in western India. Concurrently with his work in the oil industry, Comfort was U.S. vice-consul (1894-1896) and consul (1896-1898) at Bombay. From 1900 to 1903, Comfort served as U.S. vice- and deputy-consul general at Calcutta. By 1904 he accumulated a comfortable fortune and retired from active business, moving to London. On 16 October, 1866, Samuel Comfort married Elizabeth Jenks Barnsley (4 Jul. 1844—1 Mar. 1932), daughter of John and Mary (Hough) Barnsley, of Newtown, Bucks county, Pa, a second cousin of General U. S. Grant. One child was born of this marriage, Emma Walraven (1869-1923). While visiting his relatives in Newtown in August, 1923, Samuel Comfort became ill and died on 11 October 1923 (he was 86 years old).